The tying instructions/illustrations for the Red Meat Neutralizer-Orange, are exactly the same as the Red Meat Neutralizer Black-Gold, below. Simply substitute the material colors. Body: Burnt Orange Motion Flash; Medium Kactus Chenille-gold: Lee’s Pre-Cut Foam- ½” X 4mm Orange Foam. 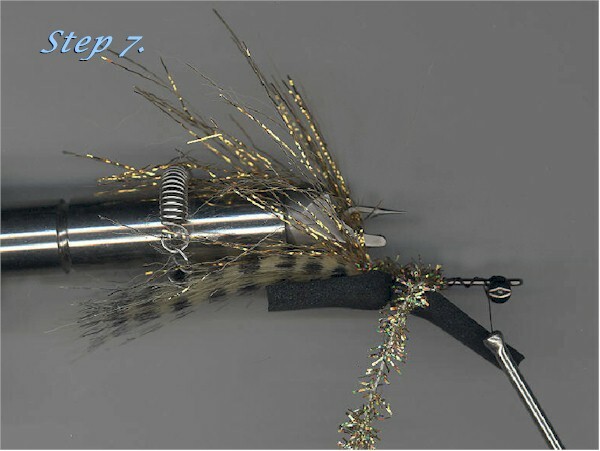 For size #1, the entire fly length should be about 2 ½” long. Tie in black 5/32 hourglass eyes, on top of the shank, directly behind the eye. 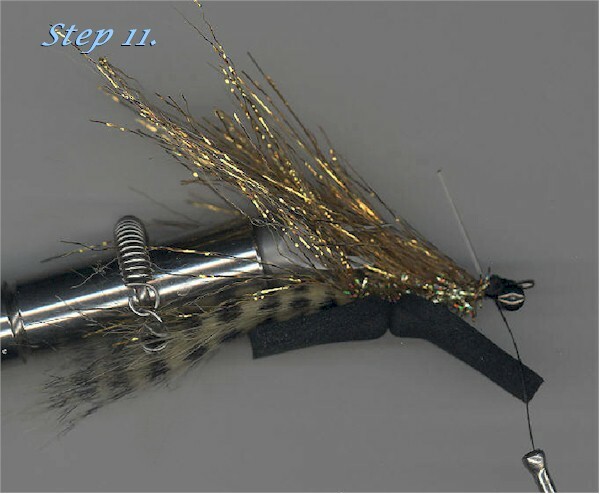 Select a bunch of Golden Tan Foxxfur (craftfur) and tie in at the bend, on top of the shank. Tail length should be about 1 ½”. Rib the tail with a black permanent marker, as shown. 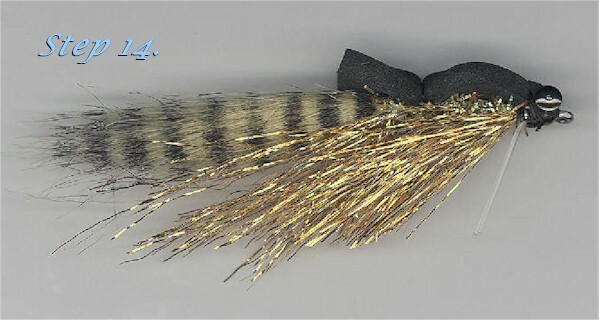 Tie in a bunch of gold Motion Flash, so that the fibers are varied in length, and extend almost to the end of the tail. Fold back the flash “butts” and tie them down. Clip the flash, out of the way. 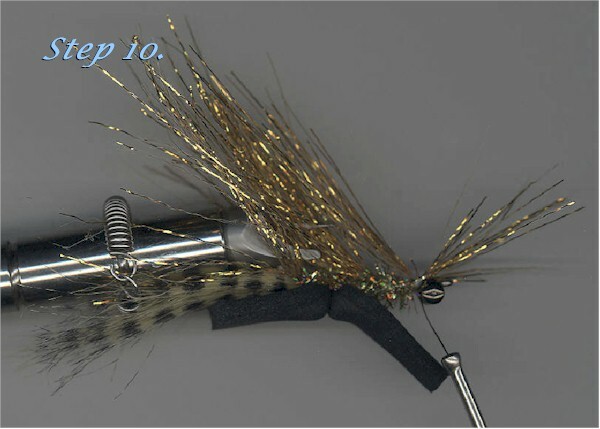 Tie in gold chenille, or holographic (as shown), and make one turn around thread wraps. 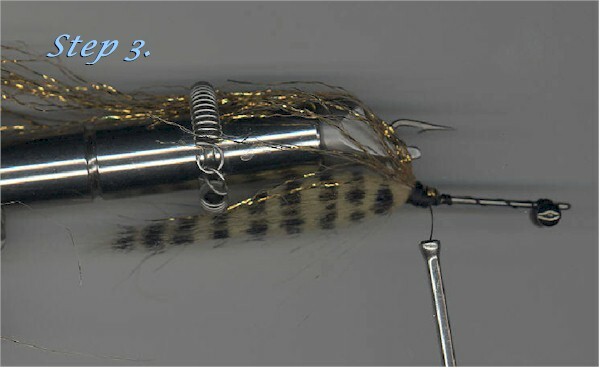 Make 2 initial wraps with light tension. Compress again, and make 2 more wraps with more tension. Repeat, adding maximum tension. 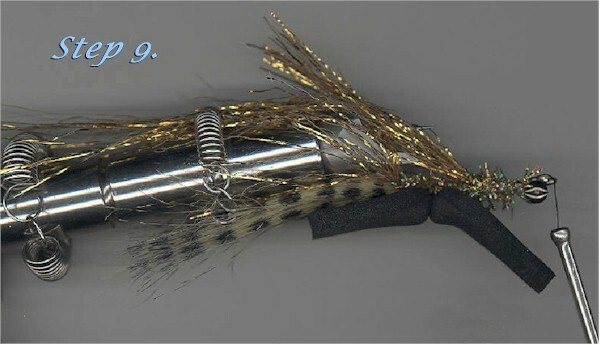 Invert fly and add CA glue to the wraps. 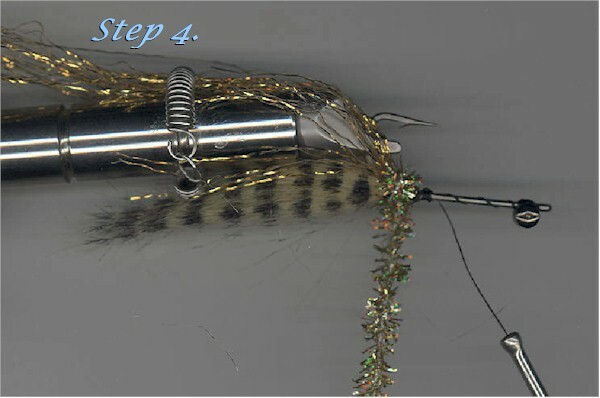 Bring chenille forward, covering the thread wraps. Bring thread forward. 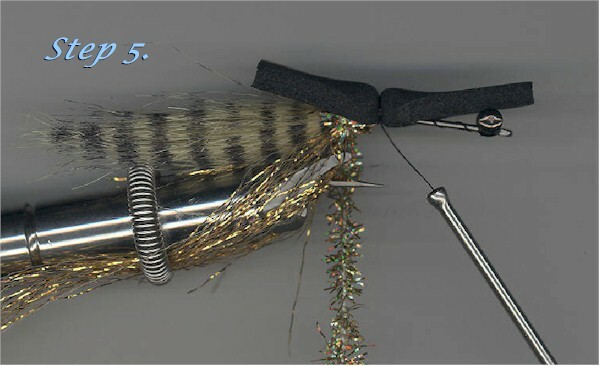 Make about 3 wraps, forward, with the gold chenille, and tie down. Loosen the clipped flash and make an angle cut toward the tail, removing the excess. Clip the chenille back. 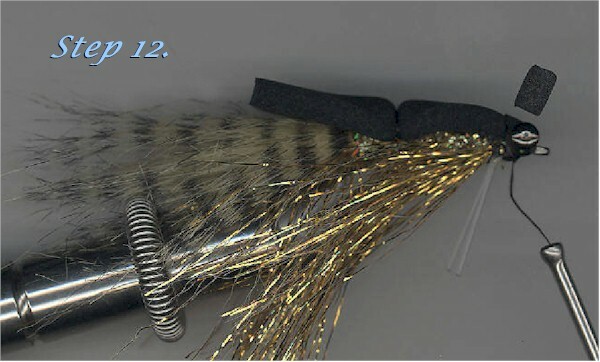 Using the excess flash, that has been taper cut, tie off the flash in front of the Chenille. Fold back the excess flash and clip to the spring. Tie off flash and bring thread forward. Bring the chenille forward and wrap it torward the eye. Cut chenille. Again, angle cut the flash and use this excess to make the final flash tie in, directly behind the hourglass eyes and in front of the chenille. NOTE: It should be noted that all the angle cuts, of the flash, do not need to be exact. A final trimming will come at the end. Fold back the flash butts and tie off. If used efficiently, a full length of flash should be the right amount for the entire fly. Add weedguard. Note: I prefer 30 lb. Mason, pre-straightened, and folded, to make a double mono weedguard. Tie down foam tab directly behind the hourglass eyes. 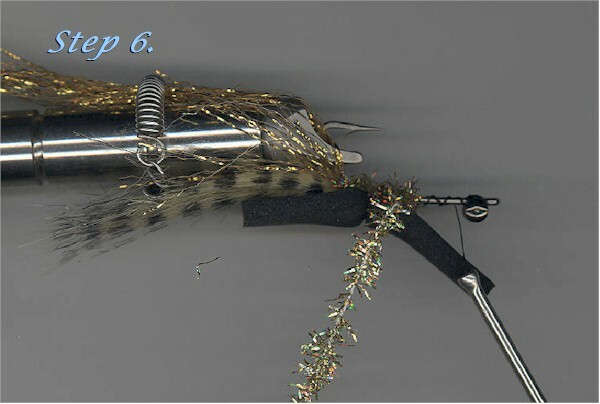 Clip the excess foam close by pressing the scissors against the foam body to make a smooth transition. 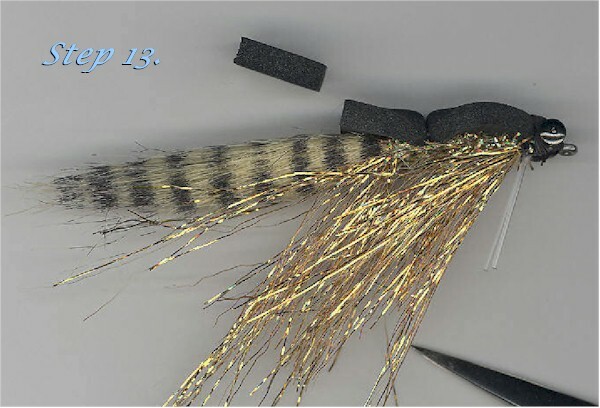 Stroke all flash fibers outward, as shown, and cut them on an angle, toward the end of the tail. 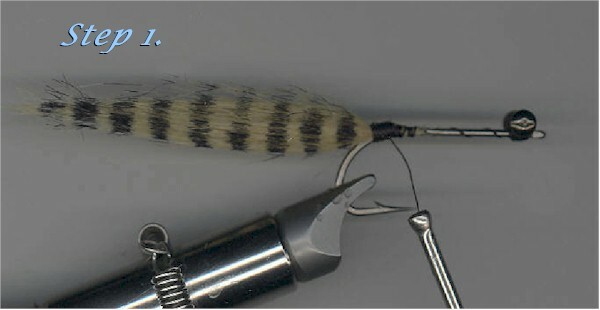 If using a Tar 812 #1 hook, and ½” Lee’s Pre-Cut Foam, 5/16” of foam will need to be removed from the back of the fly, as shown, to achieve neutral buoyancy. The final flash cut should look something like this. 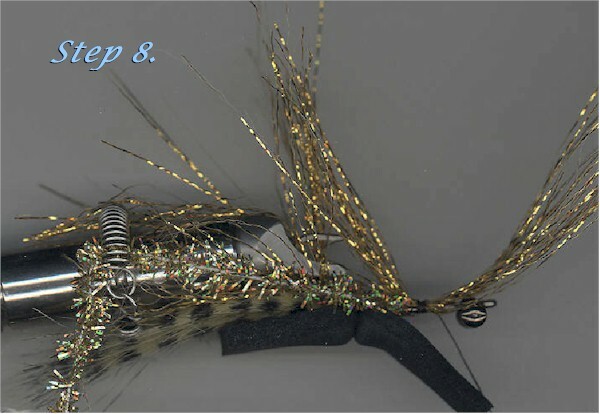 This entry was posted in Dan Blanton, Hot Flies, Lee Haskin, Red Meat Neutralizer. Bookmark the permalink.